The white mold you see forming on your apple tree's trunk is actually a colony of woolly apple aphid insects. An occasional issue, these aphids target apple trees but do not present a continual severe threat. When aphids do infest, however, they create a wide variety of cosmetic and health problems that you can avoid through observation and consistent care. Vigorous apple trees have a greater potential for fighting off and recovering from woolly apple aphid infestations than poorly cared for or weakened trees. 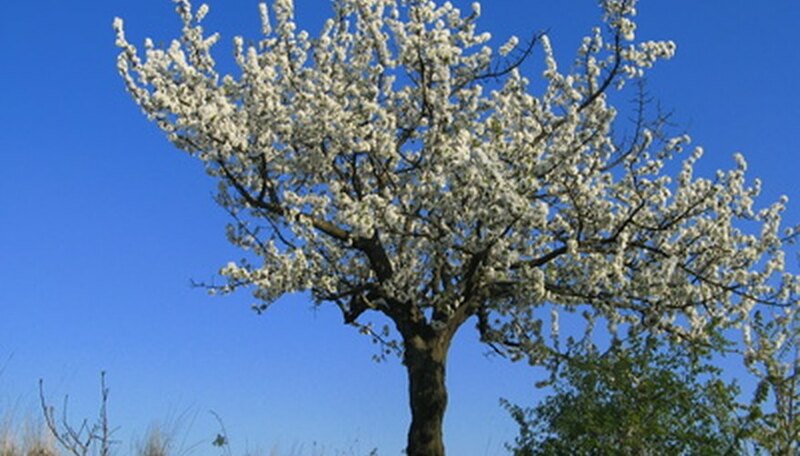 Grow your apple tree in locations that offer full sun for best growth and fruit production. Apple trees need extremely well-drained soil as waterlogged roots result in tree decline, according to the Texas A&M AgriLife Extension. Woolly aphids are small, soft, red-purple insects measuring approximately 7/10 inch in length in their adult stage. Nymphs, or young aphids, display a red-brown hue. Aphids infest trees both beneath the soil surface and above. Those that live above ground surround themselves in white waxy filaments that take on a fuzz-covered appearance. Colonies of woolly apple aphids join together on trunks as well as other areas like branches. The congregation of aphids forms what looks like white mold growth on the trunk of your tree. Aphids are "sucking bugs" that remove sap, or tissue fluid, from your tree. When woolly apple aphids feed, they create a sugary substance called honeydew. The excretion of honeydew results in the attraction and formation of a fungal infection called sooty mold. As aphids feed on tender tissues like leaves and bark, moldy black spots that resemble soot, as the name suggests, form on their sites. Leaves curl and yellow. Yellow spotted leaves result from the discoloration and the presence of sooty mold. Your apple tree will experience overall diminished health due to this infestation. As aphids also feed on roots, established trees often recover, but young trees commonly die as a result. When planning your home landscape, avoid planting other highly susceptible trees to prevent the reoccurrence and spread of aphids. Woolly apple aphids commonly seek out host trees in pear trees, elms and mountain ashes, among others. Provide natural control with the release of parasitic wasps, according to the Ohio State University Extension. Parasitic wasps are natural predators that kill aphid eggs without harming your plants. Purchase this natural enemy in garden supply stores or catalogs. For severe infestations of aphids that look like white mold on your apple trees, prevent the yellow spotting of leaves and decline of your tree with the application of a chemical control. During the end of spring or beginning of summer, apply an insecticide with the active ingredient diazinon, or apply insecticidal soap for effective control. For assistance or more chemical options unavailable to home gardeners, contact a licensed professional.